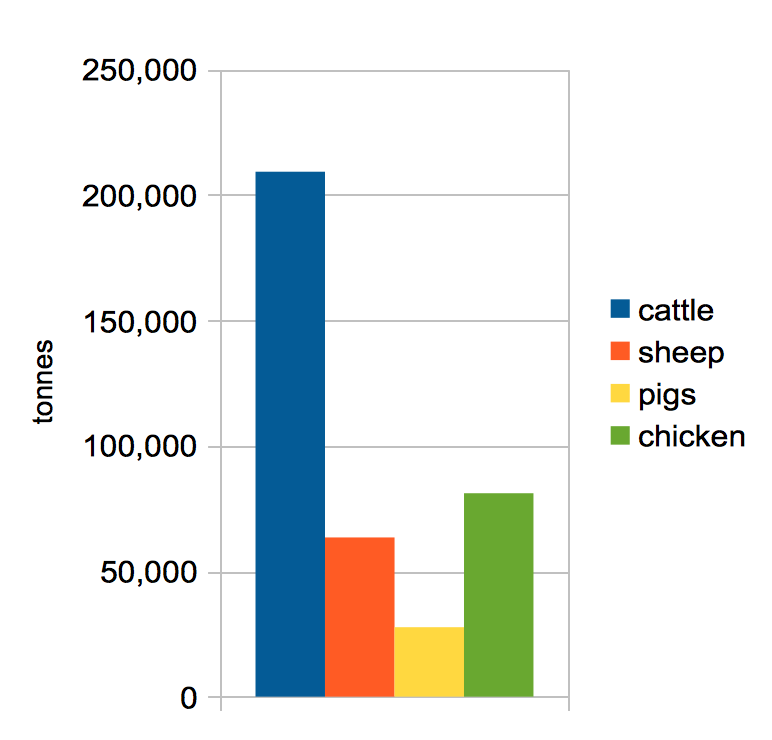 Ethical economics: the externalities of eating meat. So this is not a diatribe or an attempt to persuade you to stop eating meat. It’s an attempt to persuade you that economics provides ways of thinking about issues beyond what you may expect. Meat-eating can be considered as an economic issue. There are externalities to take into account. CO2 emissions is one (agriculture is omitted from our carbon tax). But another is the ethical issue of killing. That might not seem like an externality – it’s central to the process – but it is external to the market. There is no price mechanism that accounts for the slaughter of the animal. 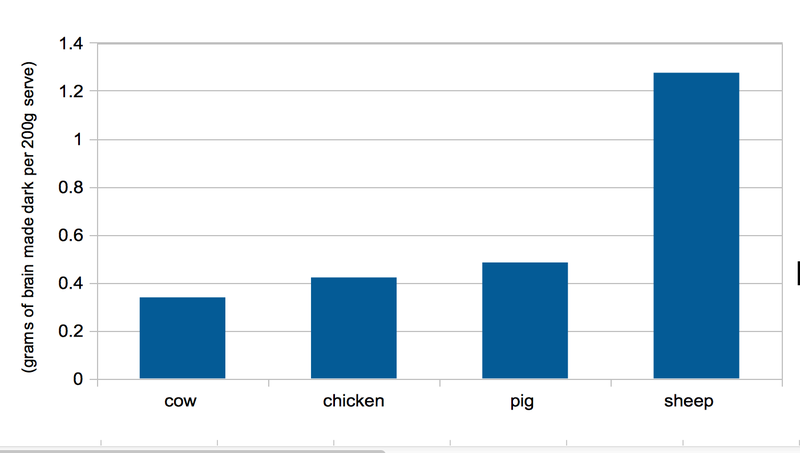 If we model that as an externality, there are important differences in the number of kills per mouthful of meat. 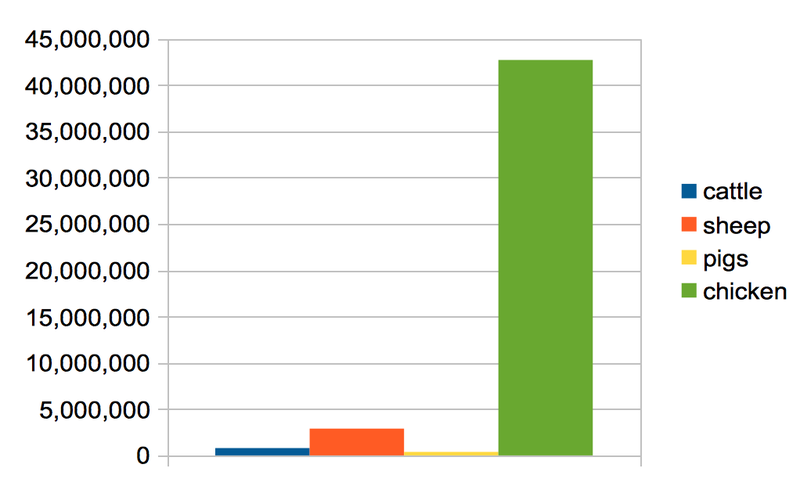 Here’s the monthly tonnage the industry produces. The result of that is that every meal represents a different amount of the externality in question. This is important information. If we aim for a buddhist ideal of minimising killing, perhaps we ought to eat only very large animals? 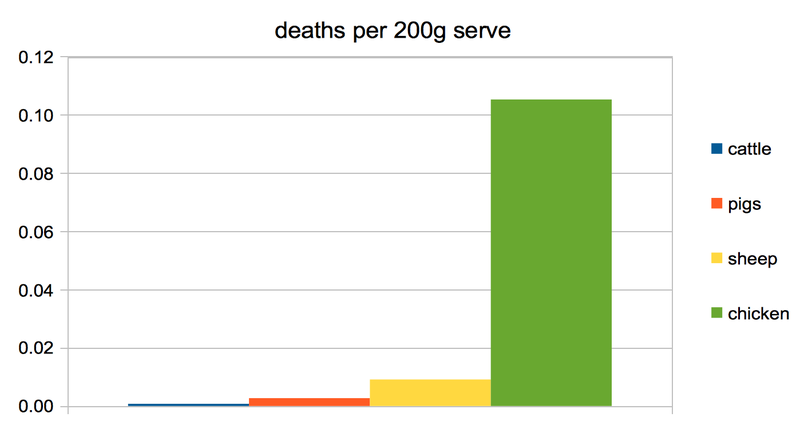 But deaths are not equal. Even fervent vegans would place more ethical and emotional weight on the death of an elephant than a fly (I think). What happens if we weight these creatures by their brain size? In this case, the chicken races up the league table to be a relatively ethical choice. The sheep, with a modest body size for its biggish brain, becomes the least ethical choice. If you are interested in reading a bit more about animal intelligence, I found this article particularly amazing. Pigs have the intelligence of a 3 year old child…. Andrew Bolt’s readers have the intelligence of a slow witted and particularly stupid chicken, or is that being unfair to chickens, some of whom are really quite nice creatures to be around. Previous Previous post: Do you really get a job by looking at job ads? Next Next post: Unemployment is down! We Think!